Grind the coconut flakes with the sugar until you have a coarse powder. Dip your glass rim in some pineapple juice, then into the coconut sugar and chill in the freezer. Pour the vodka and the rums, the coconut water and the pineapple juice into a martini shaker with ice and shake until well chilled. Pour into your cold martini glass, garnish with your pineapple spear, if you have it, and a few of the raspberries on a cocktail pick and serve. 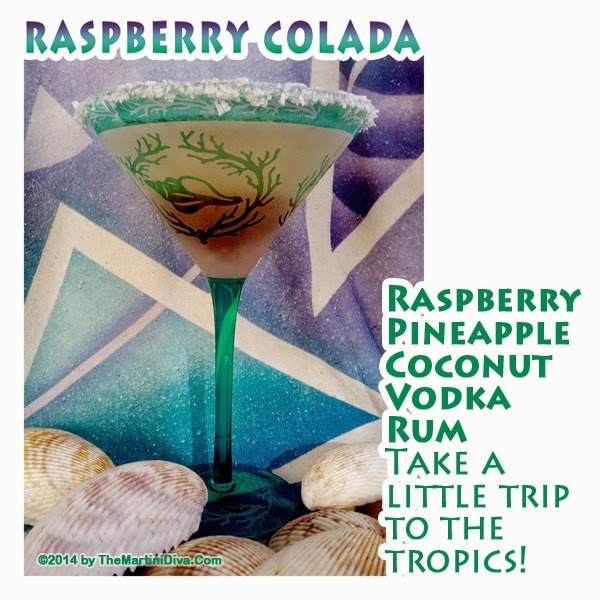 Mix up a view, play Rupert Holmes ESCAPE, The Pina Colada Song, and take yourself away to a tropical locale!